Star Trek: The Next Generation (TNG) focuses on the 24th century adventures of Captain Jean-Luc Picard aboard the U.S.S. Enterprise (NCC-1701-D). This incarnation of the famous starship is much larger than the one captained by James T. Kirk a century earlier, and, accordingly, it carries a larger crew complement: 1,012 men, women…and, surprisingly, children. This era’s Starfleet Command believes that men and women are more likely to sig..
Star Trek: The Next Generation Season Two returns to the final frontier at warp speed in brilliant 1080p high definition and digitally remastered 7.1 sound. Captain Jean-Luc Picard (Patrick Stewart) leads the crew of the Enterprise through a new season of new friends, new foes and amazing adventures. Introduced this year are Whoopi Goldberg as the mysterious Guinan bartender of the Ten Forward lounge, Diana Muldaur as the ship's Chief M.. Starting with Captain Picard's terrifying battle to escape from the inhuman Borg and culminating with the Klingon Empire on the brink of civil war in the series' historic 100th episode, you can now experience Season 4 and so much more on breathtaking Blu-ray. This set features dazzling 1080p high definition picture with visual effects painstakingly re-created from original film elements, digitally remastered English 7.1 sound, and a wea..
Star Trek: The Next Generation Season Five is simply stunning on Blu-ray with 1080p high-definition picture. Experience enhanced visual effects rebuilt from the original film elements and surround yourself with the digitally remastered English 7.1 sound (or choose the original broadcast audio). 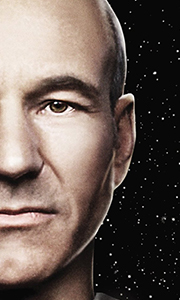 In a season that garnered four Emmy Awards, you’ll be plunged into the 24th century for some of the series’ most thrilling moments, including Ca..
Star Trek: The Next Generation (TNG) focuses on the 24th century adventures of Captain Jean-Luc Picard aboard the U.S.S. Enterprise (NCC-1701-D). This incarnation of the famous starship is much larger than the one captained by James T. Kirk a century earlier, and, accordingly, it carries a larger crew complement: 1,012 men, women… and, surprisingly, children. This era’s Starfleet Command believes that men and women are more likely to si.. Newly restored and meticulously re-mastered in brilliant high definition, Star Trek: The Next Generation still dazzles as a true milestone in TV history. Here are the breathtaking adventures of the U.S.S. Enterprise-D presented in state-of-the-art Blu-ray format, with such thought-provoking episodes as “The Measure of a Man” and “The Inner Light”; the return of the Borg in “The Best of Both Worlds”; and the time-shattering confrontation.. Season Three of Star Trek: The Next Generation took televised science fiction storytelling to new heights. Now, on high definition Blu-ray, the seminal season of this beloved series is more spectacular and compelling to watch than ever. Experience such thought-provoking episodes as "The Survivors," "Sins of the Father," "The Offspring" and one of the great cliffhangers in television history: Part One of "The Best of Both Worlds"... like..
Own Star Trek - The Next Generation Season 6 DVD from Deff, DVD, Blu-Ray & 4K Video Specialists - Free UK Delivery.. The intergalactic voyage reaches infinite new depths in Star Trek: The Next Generation Season Seven. Featuring the crystal clarity of 1080p high-definition Blu-ray, digitally remastered 7.1 sound, and effects rebuilt from the original elements, you’ll experience the mission of the USS Enterprise like never before. In this Emmy-nominated final season, Lt. Commander Data (Brent Spiner) confronts an alliance between his sinister duplicate ..
Own Star Trek - The Next Generation Seasons 1 to 7 Complete Collection DVD from Deff, DVD, Blu-Ray & 4K Video Specialists - Free UK Delivery..